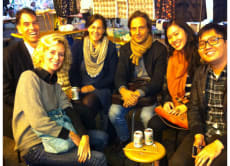 Hi, I'm Edmond and I'm one of a group of foodies who will guide you on a walk to sample authentic Hong Kong street food. I'm originally from Hainan but grew up in Hong Kong and love exploring the different cuisines that this bustling city has to offer. This guided walking tour is a highly personalised experience that takes you to some of my favourite places in Kowloon. If you love trying new things, I know you will love seeing how the locals eats - on the street and in the dai pai dongs.